Not every bad guy can have cosmic origins. Some bad guys are simply things that annoy Axe Cop . . . like the Lamp That Comes Alive Early In The Morning. As most gamers avoid mornings, we're very sensitive to the horrors this monster could wreak upon our world. 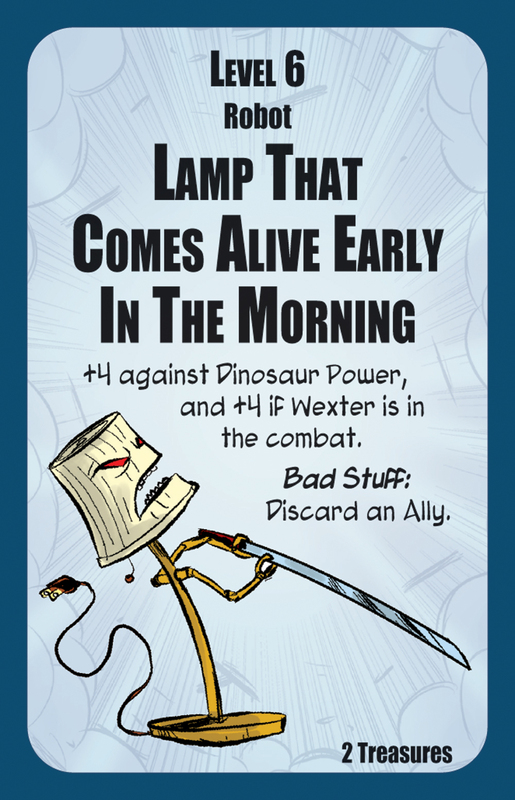 Imagine: the Lamp That Comes Alive Early In The Morning attacks even before you have a chance to hit the snooze button on your alarm clock! Of all the bad guy behavior, I find "waking me up unnecessarily early" to be the worst! 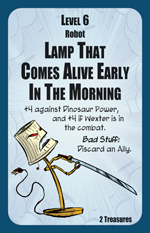 Lamp That Comes Alive Early In The Morning can be beaten senseless when Munchkin Axe Cop hits store shelves in early November.